We stayed here for 2 nights for our last accomodation in Cuba. The staff were lovely and the location was great. Very close to everything that you’d want to see and experience. The neighbourhood feels safe and lively also. The room was a little run down and our bathroom sometimes smelt a little of urine. Not really sure if it was coming from outside or it was a plumbing issue. The beds were comfortable and the free breakfast was yum. I was unfortunate enough to stay at the Sercotel Lido in early September 2018 for 5 nights. The lack of customer service was on display from the moment we walked up to the front door. The doorman opened the door without a “Buenos días” or even a smile. At the reception, a scowl. My “Buenos días!” was met with a grunt. We were given rooms across the hall from each other. Took the elevator up one floor to our rooms. Came down to the lobby bar and had a beer. Frowning bar tender. 20 minutes later the elevator went out of service. It continued to be out of service for the next 3 days. Since the stair wells are just slightly wider than I am, are very steep and I navigate using a cane, getting to and from my room was less than fun. Getting to the restaurant for the free breakfast was out of the question. On day 2 the toilet in my my room would no longer flush. Repeated complaints were each time met by the same response: OK I will go find someone. The person would disappear and no one would come to fix it. My friend allowed me to use his toilet - they had not come to fix it before we left 3 days later. Talk about getting by with a little help from a friend. My friend would bring me the free breakfast, carrying it down 5 floors to the lobby bar. I ate it since the alternative was to go hungry. Two eggs folded over like an omelet - without any flavor. Dry bread. Cookies. Yummy - NOT! I usually find the best part of my trips in latinamerica is the people. Not here! 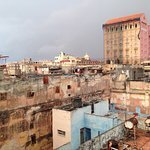 My strong suggestion is to look elsewhere for a hotel in Havana. Very good hotel with friendly staff and excellent breakfast on the roof!!! Our room was big with a nice balcony! 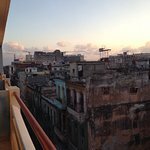 I can advise Lido to every tourist, who wants to feel the real atmosphere of old Havana! Central location, clean rooms. Cold water i the shower. Partly worn, partly under restoration. 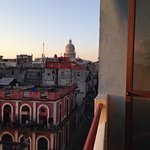 The hotel is located in the Old City of Havana (Habana Viejo) in walking distance to all attractions. The breakfast was OK. Poor communication between the people in the reseption. Our booking for two extra days, confirmed by one person in the morning, was denied by the next person, later the same day. The food in the restaurant was good. Room tip: Ask for a rom with windows. This place allows to feel real part of Havana society. It is settle in the middle of old colonial neighbourhood. Good breakfast. Helpful staff. Last day when we leave , elevator was spoiled and we must go downstairs with big luggage . Room was small and without windows . There was no hot water in bathroom. Location was great! Close to everything. The staff didn´t speak much english but was friendly and helpful. Our room was on the top floor so nice views to the city. Room was clean, there was hot water and a working AC. It´s dated. It was the only hotel we stayed in our 2 week Cuba holiday. We booked the first night there because if anybody in the border wanted an adress we had one to give. All the casas we stayed later were much cheaper, nicer, newer.